What can you do when you have a very old oak tree above your chillers? It is nice in Spring and Summer and may actually provide additional shade to reduce the heating load. There may be some additional bird droppings to cope with but it’s not really a problem. Our US cousins call it Fall and when you have an overhanging oak tree then this is the beginning of a major problem. As leaves change colour they start to die and drop off. Anything underneath gets covered and, as the winds increase, branches and twigs also fall off. If you own a chiller, then you need a free passage of air from intake to discharge and it is most common to have fans facing up. 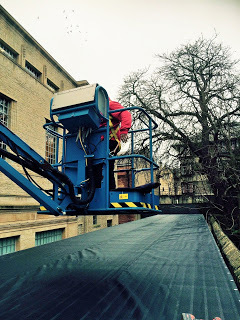 The tree and its leaves prompted Oxford University to call RABScreens to the world famous Weston Library. Beside the library were three Uniflair chillers surrounded by sound absorbing walls with acoustic louvre sections on the roof. Everything had been done to minimise noise outbreak for the scholars studying the Libraries' valuable special collections, which include rare and unique manuscripts, books and maps. However, this could not stop the falling leaves and twigs. As most chiller engineers will confirm, twigs hitting high speed fans will result in shards of wood damaging the fans and cooling coils. 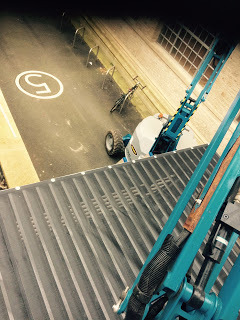 The RABScreen solution was to cover the entire roof with a 22m x 3.5m RABScreen washable filter. The static charge generated by the polyester/polypropylene mesh enables the filter to trap all seeds, pollen, leaves and twigs dropping from the tree.Now, when the wind blows, any debris will be cleared whilst the filter keeps it out of the acoustic enclosure.